Christine Park, M.D., a recognized leader in simulation and the 2017 president Society for Simulation in Healthcare, penned a thoughtful piece about the role that simulation plays within the nursing profession and in improving patient safety (published in the online edition of Media Planet's "Future of Health Care News"). Here are a few excerpts from that article, with added insights offered by CAE Healthcare. We hope it inspires you. ... Nurses have long been using training through simulation for procedures such as inserting a catheter or tube, and studies have shown that this type of practice reduces infections. ... Over the next five to ten years, I anticipate that simulation will become a critical part of the entire spectrum of a nurse’s career and quality simulation training will become a public demand. Learning through simulation will have a dramatic impact on improving individual, team and systems performance for the ultimate goal of patient safety. In 2017, CAE Healthcare embarked on an initiative to design a better clinical skills manikin. 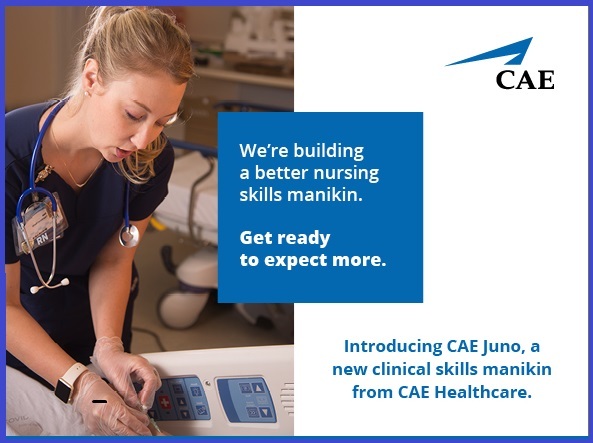 CAE Juno, a fully wireless, tetherless and modern nursing manikin, facilitates more immersive learning for today's nurses-in-training. By acquiring CAE Juno, training facilitators and students alike can expect to benefit from CAE Healthcare's long legacy of product quality, expertise, and top-level support. Innovation is the hallmark of CAE Healthcare. CAE Juno reflects that in every detail. Learn more now. Discover how CAE Juno can enrich clinical skills development. Read the complete article, "Glimpsing the Future of Nursing with Simulation", by Christine Park, M.D.